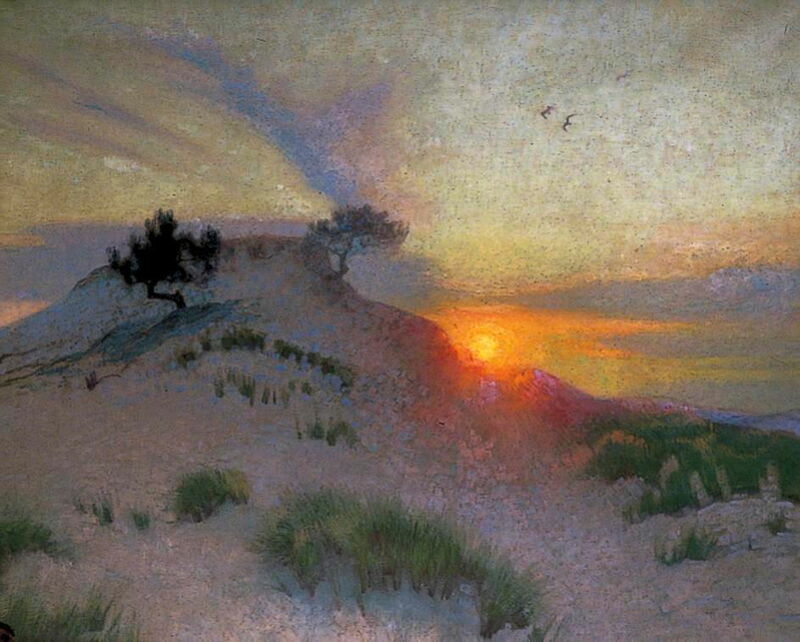 Adrian Stokes (1854–1935), Sunset (1910), oil on canvas, dimensions not known, Ramsgate Library, Ramsgate, Kent, England. The Athenaeum. Among the travesties perpetrated by the art critics of the twentieth century was that painting – as opposed to the ‘inferior craft’ of illustration – had to be avant garde. Anyone with the slightest understanding of the history of painting knows that fine art painting is a far broader church, and has enjoyed many different purposes without becoming ‘degraded’. My next (married) couple of examples of wonderful and artistic painting in the first couple of decades of the twentieth century are (Charles) Adrian Scott Stokes (1854–1935), covered in this article, and his wife Marianne Preindlsberger (1855-1927), better known under her married name of Marianne Stokes, covered in the next. Both showed in their works how painting as an art can have many purposes beyond endlessly (and ultimately destructively) pushing the boundaries. Adrian Stokes was born in Southport, Lancashire, but moved to Liverpool as a child, then to London in 1871, where he exhibited with the Royal Society of British Artists. His talent was spotted, and he enrolled in the Royal Academy Schools in London as a student in 1872. He first exhibited at the Royal Academy in 1876. That year he went to France, visiting the Pont-Aven artists’ colony in Brittany, and was influenced by Jules Bastien-Lepage, among others. At that time, most of his paintings appear to have been commissioned portraits. In 1884, Stokes married Marianne Preindlsberger, in her native Graz, Austria. The couple travelled and stayed for several months in Capri. They spent the summer seasons with the group of Danish Impressionists at Skagen in Denmark, in 1885 and 1886, where he and his wife became close friends of the Anchers. Adrian Stokes (1854–1935), Hunters on the Moor, North of Skagen (1886), oil on canvas, 37.5 x 61.5 cm, Skagens Museum, Skagen, Denmark. Wikimedia Commons. 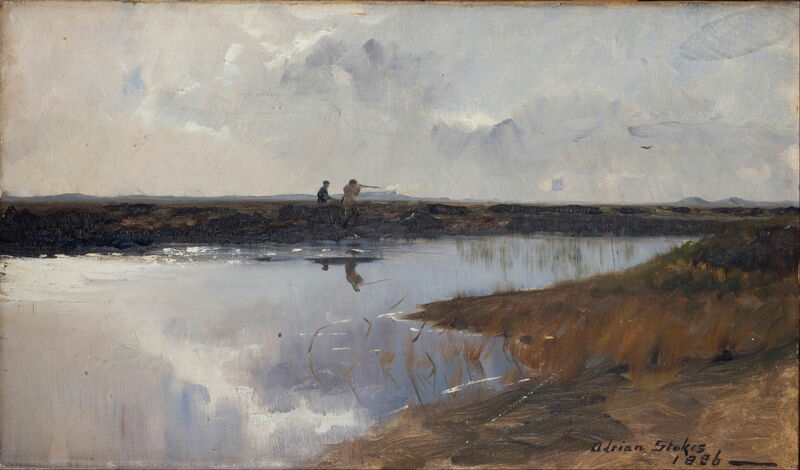 Hunters on the Moor, North of Skagen (1886) shows a pair of hunters in the flat wetlands to the north of Skagen, capturing the sky, light on the water, and the seemingly endless flatness of the land. They returned to England in 1886, where they became early members of the New English Art Club in 1887, and travelled to Italy. They settled near St Ives in Cornwall in 1887, where they became active members of its developing artists’ colony. 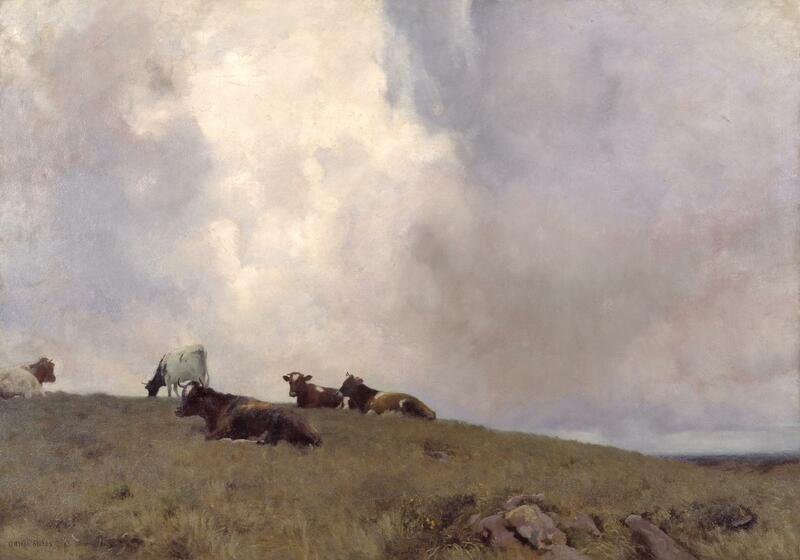 Uplands and Sky (1886-8) shows cattle in the rough moorland pasture just above St Ives, and was one of a series of paintings of the area made by Adrian Stokes at the time. In 1889, he was awarded a silver medal for his paintings at the Exposition Universelle in Paris. By 1895, he was maintaining a studio in London, as well as living near St Ives. 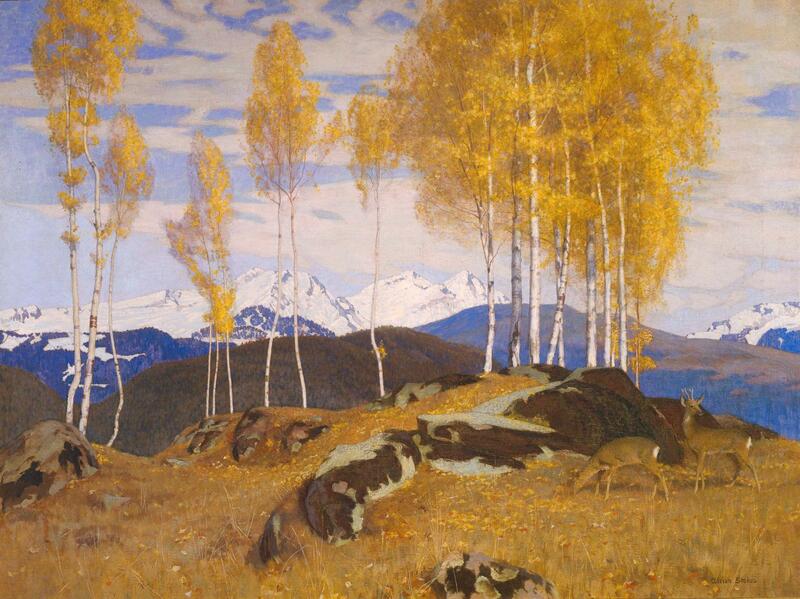 Autumn in the Mountains (1903) is a breath-taking view of a stand of birch trees in the rock-strewn upland pastures of the South Tyrol, with the serious mountains in the distance. Stokes painted this using freshly-prepared egg tempera, a medium which he used occasionally, in addition to watercolour and oils. In 1905, the couple made their first visit to Hungary, returning in 1907 and 1908. 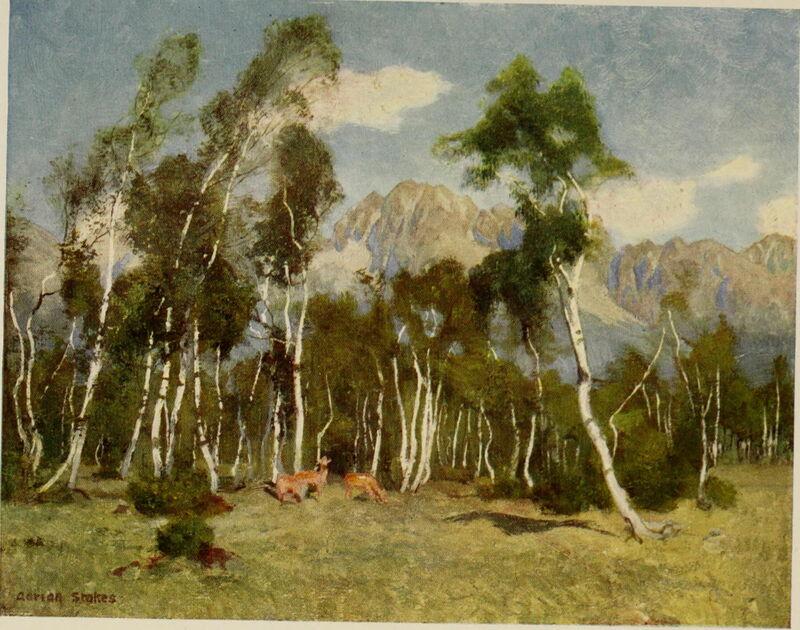 Their many paintings from these travels were exhibited from 1907 onwards, and in late October 1909, their book (see references) was published by A & C Black. The following have been taken from that: although their quality is more limited than I would like, they form a unique record of the country deep into the Austro-Hungarian Empire before it fell apart as a result of the First World War. Here is fine art as an ethnographic record, twenty-five years before practical colour photography. 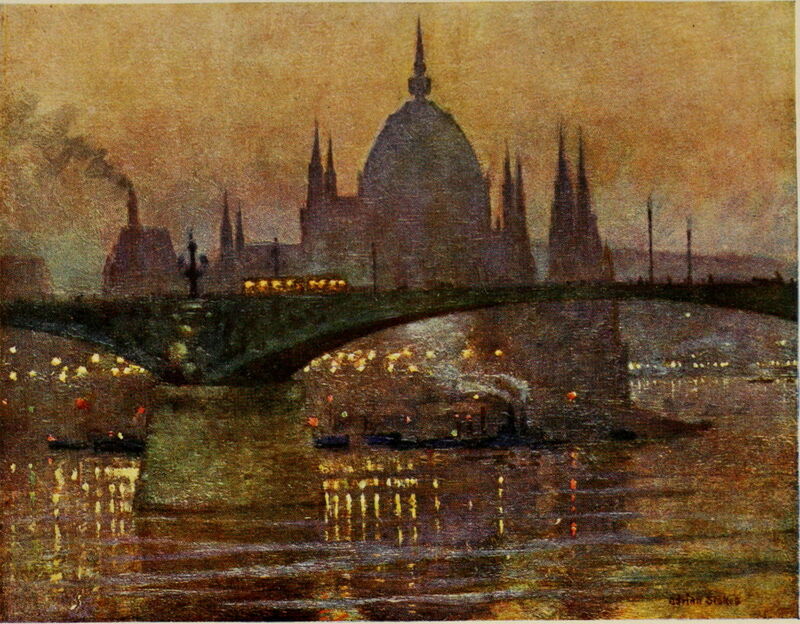 Adrian Stokes (1854–1935), The Houses of Parliament and Margit Bridge, Budapest (c 1909), oil on canvas, other details not known. Wikimedia Commons. 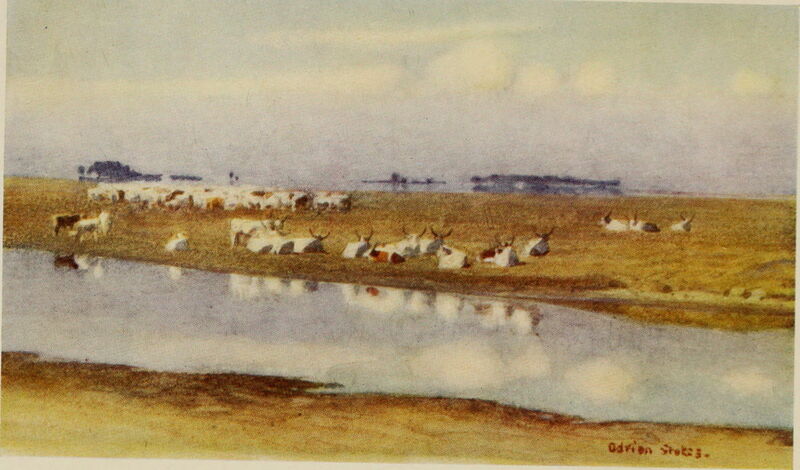 Adrian Stokes (1854–1935), Cattle on the Puszta of Hortobágy (c 1909), oil on canvas, other details not known. Wikimedia Commons. 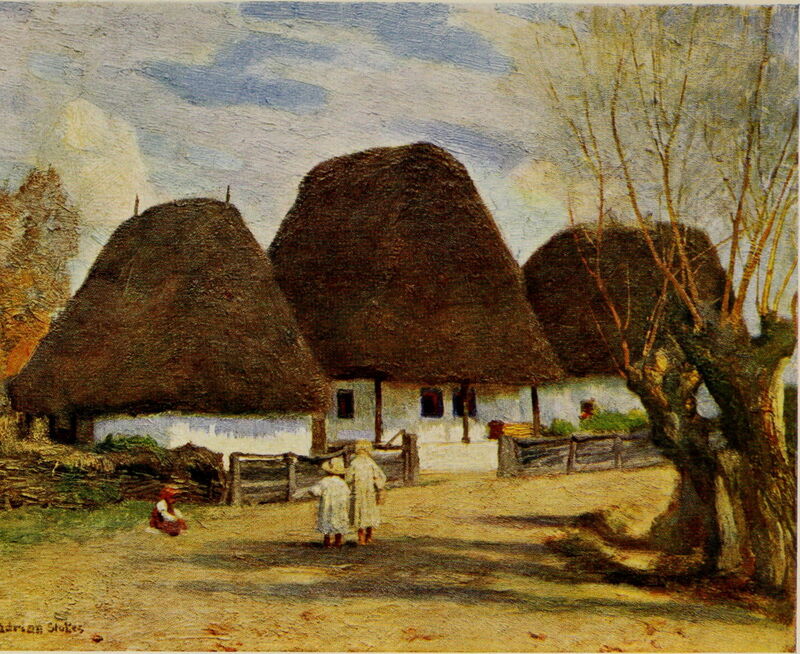 Adrian Stokes (1854–1935), Rumanian Cottages in Transylvania (c 1909), oil on canvas, other details not known. Wikimedia Commons. 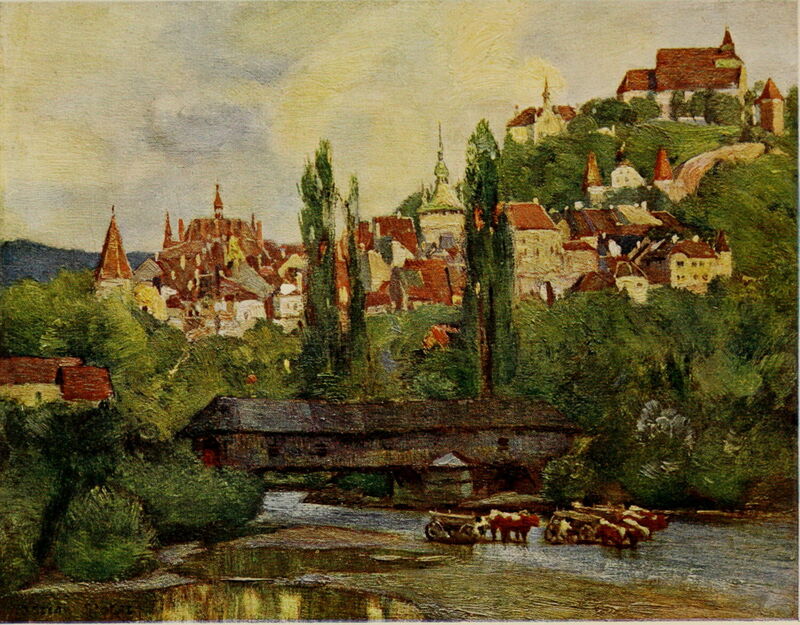 Adrian Stokes (1854–1935), Segesváṙ (Schäfsburg) (c 1909), oil on canvas, other details not known. Wikimedia Commons. 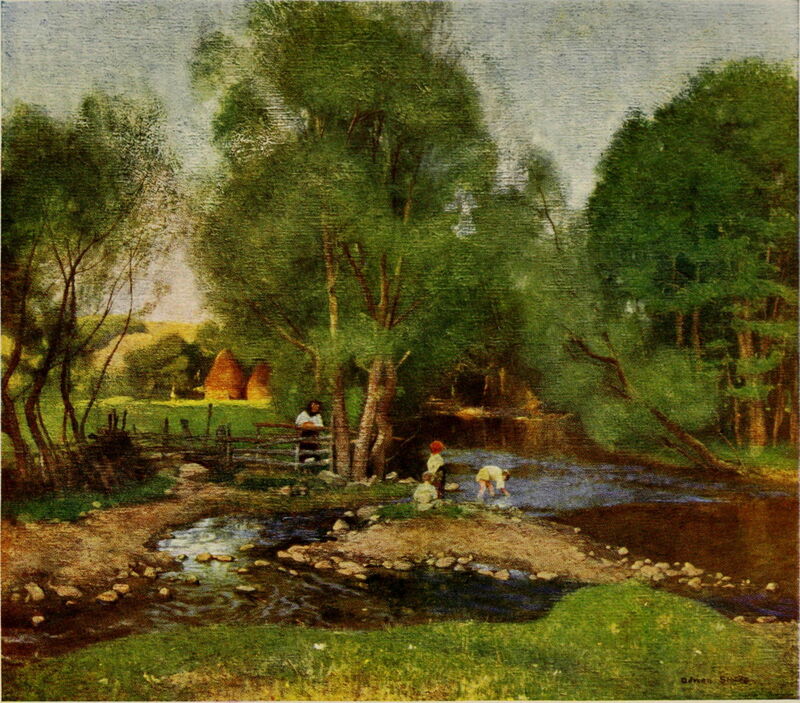 Adrian Stokes (1854–1935), Streams in East Hungary (c 1909), oil on canvas, other details not known. Wikimedia Commons. 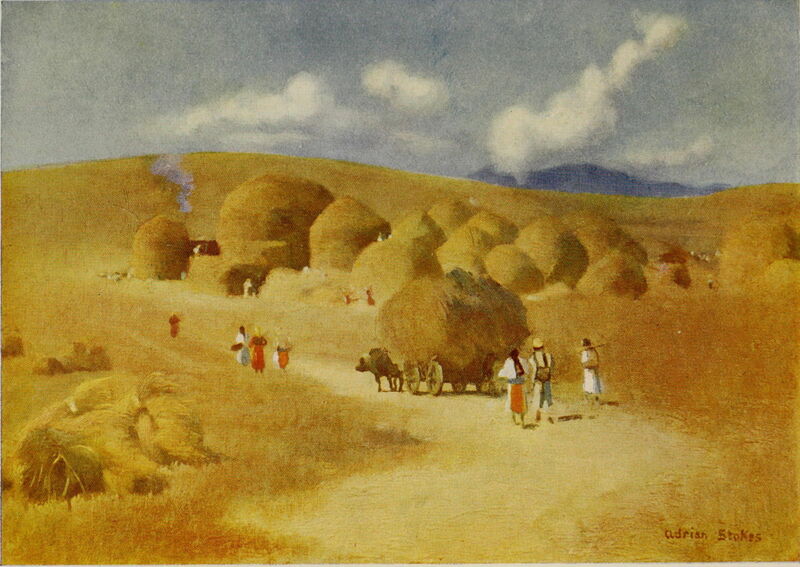 Adrian Stokes (1854–1935), Harvest Time in Transylvania (c 1909), oil on canvas, other details not known. Wikimedia Commons. Adrian Stokes (1854–1935), Haytime, Upper Hungary (c 1909), oil on canvas, other details not known. Wikimedia Commons. Adrian Stokes (1854–1935), The Carpathian Mountains from Lucsivna-Fürdő (c 1909), oil on canvas, other details not known. Wikimedia Commons. 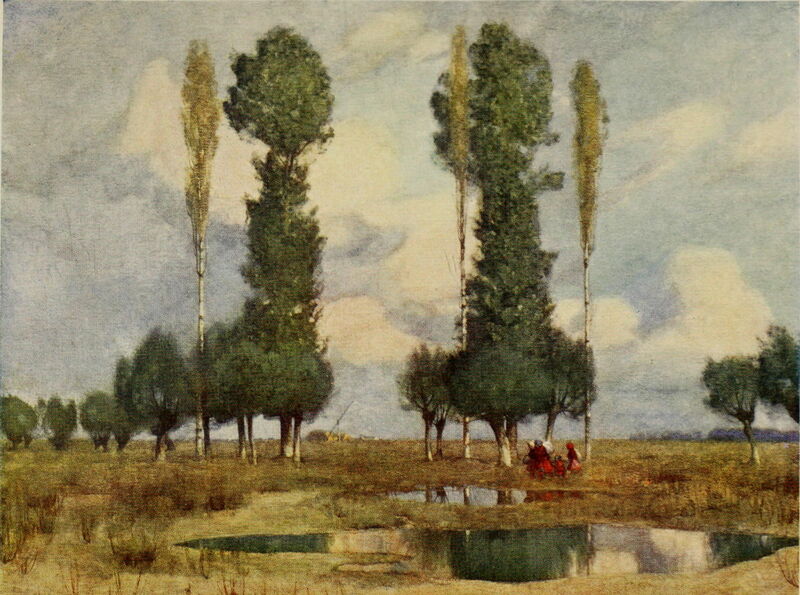 Adrian Stokes (1854–1935), On the Waste Lands Near Kalocsa (c 1909), oil on canvas, other details not known. Wikimedia Commons. 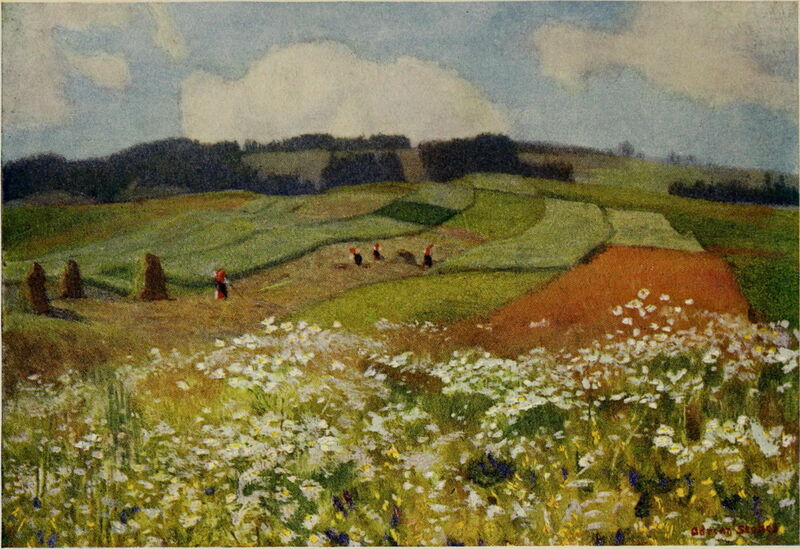 There are many more of their paintings included in their book; I have given all their dates as 1909 in the absence of any better information, although some may well have been completed as early as 1905. Adrian Stokes’ paintings used more saturated colour during the twentieth century, and he chose to paint landscapes with high chroma elements too, such as his Sunset (1910). In that same year, he was elected an Associate of the Royal Academy in London. During the couple’s travels, they had become friends with John Singer Sargent, with whom they started to travel and paint. At the outbreak of the First World War in 1914, they were travelling with Sargent in Austria, which was then at war with Great Britain. The group was forbidden from leaving Austria, but by mid December had managed to reach Switzerland. In 1919, Adrian Stokes was finally elected a full Academician, and in 1925 his book on landscape painting was first published; it was last reprinted as late as 1956. 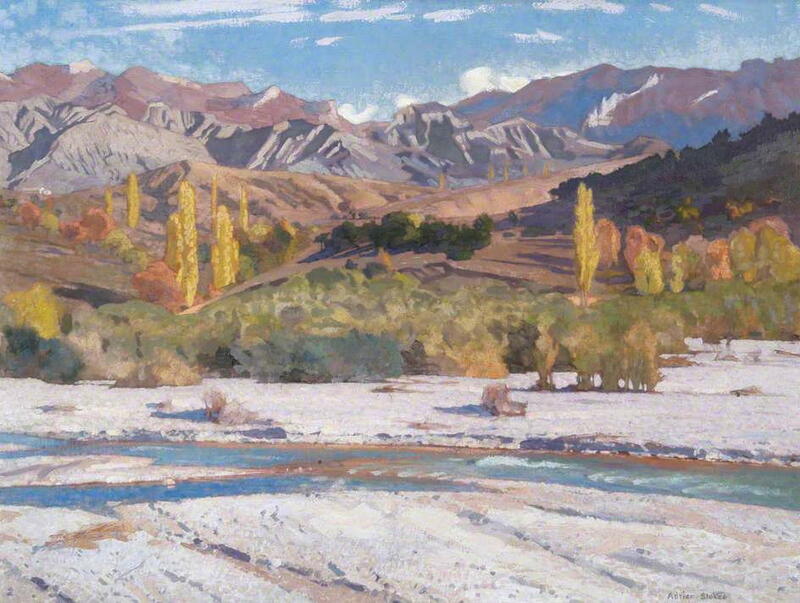 Stokes continued to paint well into the twentieth century, still retaining his love of big landscapes with high chroma colours, as in his Autumn in the South of France, Hautes Alpes (1928). Adrian Stokes (1854–1935), Autumn in the South of France, Hautes Alpes (1928), oil on canvas, 76 x 100 cm, Leamington Spa Art Gallery, Royal Leamington Spa, England. The Athenaeum. The next article will look at the paintings of Marianne, his wife. Evans, M (2009) Utmost Fidelity, The Painting Lives of Marianne and Adrian Stokes, Sansom & Company. ISBN 978 1 9045 3785 4. Posted in General, Painting and tagged Hungary, Impressionism, landscape, painting, Post-impressionism, Sargent, Skagen, St Ives, Stokes. Bookmark the permalink.